Through nanotechnology, physicists Dr Raymond McQuaid, Dr Amit Kumar and Professor Marty Gregg from Queen’s School of Mathematics and Physics, have created unique 2D sheets, called domain walls, which exist within crystalline materials. The sheets, which are a few atomic layers wide, are almost as thin as the wonder-material graphene. However, they can do something graphene can’t – they can appear, disappear or move around within the crystal, without permanently altering the crystal itself. “As things currently stand, it will become impossible to make these devices any smaller – we will simply run out of space. This is a huge problem for the computing industry and new, radical, disruptive technologies are needed. 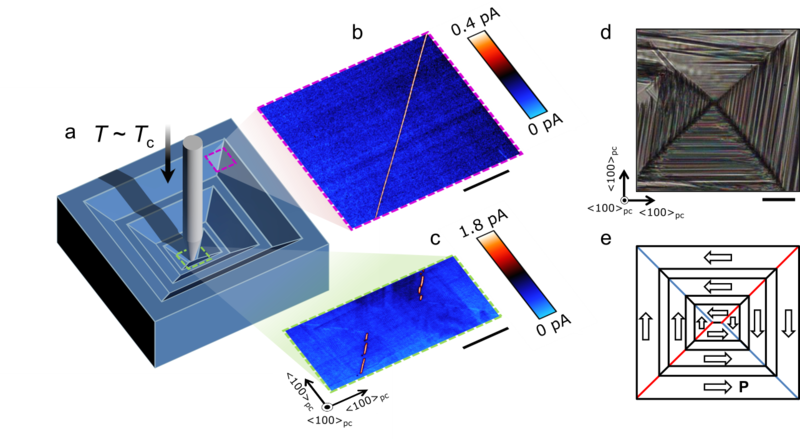 The full paper, entitled ‘Injection and controlled motion of conducting domain walls in improper ferroelectric Cu-Cl boracite’ is available at Nature Communications. Through the research, the Queen’s scientists have discovered some solutions to the hurdles. Their research proves that long conducting sheets can be created by squeezing the crystal at precisely the location they are required, using a targeted acupuncture-like approach with a sharp needle. The sheets can then be moved around within the crystal using applied electric fields to position them. Dr Raymond McQuaid, a recently appointed lecturer in the School of Mathematics and Physics, added: “Our team has demonstrated for the first time that copper-chlorine boracite crystals can have straight conducting walls that are hundreds of microns in length and yet only nanometres thick. “The key is that, when a needle is pressed into the crystal surface, a jigsaw puzzle-like pattern of structural variants, called “domains”, develops around the contact point. The different pieces of the pattern fit together in a unique way with the result that the conducting walls are found along certain boundaries where they meet. To take the research on domain walls further, the Engineering and Physical Sciences Research Council has recently awarded a Critical-Mass grant worth £2.3m, led by Professor Gregg, across several UK institutions including Universities of Cambridge, Warwick and St Andrews. The Centre for Nanostructured Media has also been awarded a Queen’s Central Research Infrastructure bid to purchase a state-of-the-art atomic force microscope which would also help further the research efforts in realising domain-wall based nanoelectronics.